Past Chariman of the USSS Board of Governors Wallace Cleland was inducted into the USSS Hall of Fame February 28th at our Annual Meeting in St. Louis. Wallace Cleland is a nationally recognized researcher, collector and writer on numerous philatelic subjects, particularly the production and printing of U.S. postage and revenue stamps. His service to organized philately is most recognized by his contributions to the United States Stamp Society. 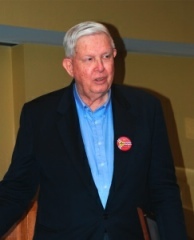 Wallace served as Chairman of the Plate Number Check List Service for many years, and in 1989, he was elected to the Board of Governors. In 1992, Wallace was elected to the Chairmanship of the Board of Governors and in August of that year also served the Society as its twelfth President through the remainder of that year. He served with distinction as the Society’s Board Chairman through 1997 while continuing his contributions to plate number studies. In 2006, in honor of his exemplary service, Cleland received the George W. Brett Century of Service Award. The APS recognizes Cleland’s knowledge, using his experience and skills for their expertizing service. He is also an advisor to the National Postal Museum for their Revenue Stamps Catalog project. For forty years, Wallace has been one of the most prolific contributors to The United States Specialist on a wide variety of topics from plate numbers and markings, coil production, production of the Series of 1922, and the Washington-Franklin Series Coil Waste Issues. He is widely recognized for original research on revenue stamps and revenue plate markings. He has authored an extraordinary total of 220 articles that have appeared in The United States Specialist and the Canal Zone Philatelist, a total that increases virtually monthly with each new issue of The Specialist. Cleland is a three time winner of the Hopkinson Memorial Literature Awards (1986, 2002, 2006), given for the best article published in The U.S. Specialist. For his distinguished contributions to philately, Cleland was awarded the prestigious Smithsonian Philatelic Achievement Award in 2008. Wallace Cleland’s dedication to the United States Stamp Society and his contributions to U.S. philatelic research and knowledge make him worthy of the highest honor the Society can bestow.